Nancy-Lee Mauger is a gifted visual artist who began her career as a musician. She was an accomplished French Hornist in the Boston area for 32 years. Despite her love of music, her chosen path was not always smooth. She coped with mental health issues for many years. Along the way she discovered art therapy and began painting. 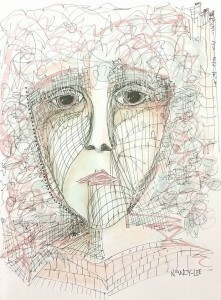 In 2010, Nancy-Lee was diagnosed with Dissociative Identity Disorder. 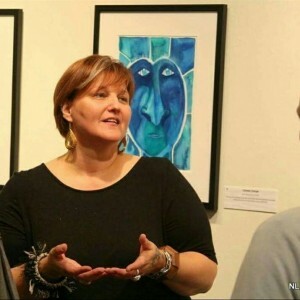 Nancy-Lee has pursued art in a number of arenas, including creating public works of art around Boston and creating works for solo exhibitions locally. She is starting her first book illustration and plans to write about her experiences with art and disability to provide support for others with similar aspirations and experiences. Nancy-Lee also hopes to use her art as a way to promote Mental Health Awareness. In addition to being a musician and painter, Nancy-Lee is the mother of two children, now young adults. She lives in Needham, Massachusetts. My discovery of art was bittersweet. In the early morning on December 9th 1993, my father passed away. Later that evening I gave birth to my second child, my son. The juxtaposition of these two events was a turning point in my life. Eighteen months later I took my first art therapy class and found the healing power of art. Over time, my work has evolved from the therapeutic painting to art. I paint because sometimes there are so many feelings bouncing around that, if I don’t paint, my head feels like it might explode. All of my painting is spontaneous. It is only after I paint that I know the story. I look at the work and understand it. It strikes me. I hear a title and then have to listen to the story. I am very often quite literally surprised by the outcome. My room is my studio, my head, my easel. For me, colors are like children. They play freely on the paper and make their own friends. When I think the painting is done I turn it around so I can consider all four perspectives. There is always something that appears. A face, an animal, a building. I work the painting into a finished product either by adding ink or marker or just more paint. There is something about the moment the color hits the paper that is as perfect as hearing the first note of a symphony. I control how, when, which color, how light, how dark – I get to compose the entire piece and play all of the parts at the same time. When I am able to paint, despite whatever is going on inside of me, I always end up in a better place. I often paint into the early hours of the morning. I am thankful for this outlet. My world can often feel quite gray. Extremely overwhelmed and not quite sure what to do with myself. Everything I’ve been working on for the past several months is done. My opening was amazing. My show is up for 5 more weeks. I’m walking around in a daze. Time to get back to my paint brush.